(Nanowerk News) Metal-organic frameworks (MOFs) are a new type of materials with nanoscale pores. Bioscience engineers from KU Leuven, Belgium, have developed an alternative method that produces these materials in the form of very thin films, so that they can easily be used for high-tech applications such as microchips. The study was published in Nature Materials ("Chemical vapour deposition of zeolitic imidazolate framework thin films"). 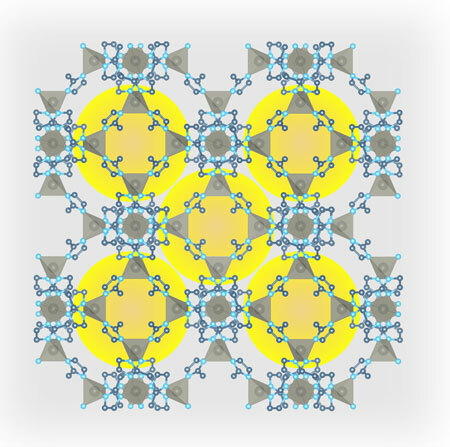 Metal-organic frameworks (MOFs) are a recently developed type of materials that consist of a nanoporous grid of both organic molecules and metal ions. MOFs take shape as the organic molecules push the metal ions apart, so that a regular pattern of tiny holes or nanopores develops. The size of the pores can be tuned at the nanoscale level (with a nanometre being a billionth of a metre). The internal surface of an MOF, formed by all these pores, varies in size from 1,000 to 5,000 square metres per gram of material. MOFs can be seen as microscopic sponges that can absorb a lot of material. The 3D structure of the metal-organic framework used in this study. The nanopores are represented as yellow balls. This property makes MOFs interesting in terms of applications. "Researchers are already looking into these applications", says Professor Rob Ameloot from the KU Leuven Centre for Surface Chemistry and Catalysis. "They are examining the use of MOFs as catalysts to accelerate chemical reactions of guest molecules in the MOF pores. Another possible application is gas storage, as the internal surface of MOFs can hold large amounts. So far, some applications were not considered feasible due to the production procedure for MOFs. The conventional method involves lab-scale wet chemistry -- the traditional chemistry with solutions and solvents. The end result is a powder. For integrated, nanoscale applications, the particles of that powder are too large, while a method with solutions is not pure enough. In the case of gas sensors, for instance, the MOF material has to be deposited as a thin film over the surface of the electrical circuit. That is not possible if you use the conventional production procedure." Lead author Ivo Stassen set out to find a production method other than wet chemistry. He used vapours and gases instead of liquids. "Vapour-phase deposition is already a common method to produce high-tech devices. We are the first to use this method for the production of these highly porous materials. We first deposit layers of zinc and let them react with the vapour of the organic material. The organic material permeates the zinc, the volume of the whole expands, and it is fully converted into a material with a regular structure and nanopores", Stassen explains. To fine-tune the procedure, he is collaborating with the Leuven-based research centre imec, which specialises in nanoelectronics. KU Leuven and imec have jointly submitted a patent application. "This alternative production method opens up new possibilities for MOFs in terms of applications and industries. Chemical vapour deposition is a common technique in nanofabrication. Therefore, new MOF applications can be developed relatively quickly: gas sensors, nanochip components, and improved batteries", Stassen concludes.